Here you will find details of other Gong and Sound Healing Training, Events and other useful resources. Delighted to announce that my teachers from Tone of Life ( Tom Soltron and Abby DelSol ) will be in London in June for a Concert and a Gong Workshop. Concert Tickets can be booked via https://www.eventbrite.com/e/tone-of-life-concert-for-mother-earth-tickets-24928159797?aff=es2 and Workshop tickets via Meetup Not to be missed!! How about this for a summer break from London ? This is surely heaven for Gong enthusiasts and Nature lovers. Gong camp – A not for profit gathering for Gong practitioners, Gong enthusiasts, and Sound Therapists to come together for a weekend of sound and movement related activities. gong camp offers peaceful, traditional, back to nature, off grid camping in the beautiful Mid Devon countryside. This is eco camping amongst 100 acres of fields, woodlands, camping terraces and walking tracks. Wholesome and nutritious vegetarian/vegan meals are included during the weekend and other special diets can be catered for if requested at time of booking. One fee of per person covers everything for the three days: camping facilities, meals, snacks, teas, coffee, bottled water, and entertainment. There are no ‘hidden’ extras and nothing is for sale at gong camp. Blessed to have both Abby and Tom as my Gong Master teachers along with Don Conreaux. They run a beautiful retreat centre in Poland. The College of Sound Healing provides a comprehensive training in sound healing and sound therapy with highly experienced tutors. The College is a non-profitmaking organisation. The College is a member of the Sound Therapy Association, the Complementary Medical Association and the IICT. Our highly successful Sound Healing Practitioner Training course has been running since 1998. The College also offers a Gong Practitioner Training course and a Sacred Drumming Practitioner Training course. All these courses concentrate on practical experiential learning. Offers high quality training courses including Group Sound and Voice Therapy and Voice and Sound Practitioner level diplomas in the UK and overseas. They also conduct ongoing research and development programmes with the aim of furthering the field. ADC Drums http://adcdrums.co.uk/Gongs__c-p-0-0-229.aspx – I only recently stumbled upon this site for fairly priced Paiste Gongs and accessories. http://www.toneoflife.com.pl/shop/ Tone of Life are suppliers of various sound healing instruments and accessories including Himalayan and Crystal Bowls, Bells, Flutes and more. They also produce their own Gongs and Gong Stands. http://www.ecymbals.co.uk/ Julian has a wealth of information on all things gong. http://www.soundtravels.co.uk/ Suppliers of various sound therapy related products from all over the world including Drums, Sansulas, Koshi Chimes, Shrutis, Tuning Forks, Sound Healing Books and more. When you talk about Gong you automatically think Don! I was very fortunate to have attended several training sessions with Don in London and in Poland. 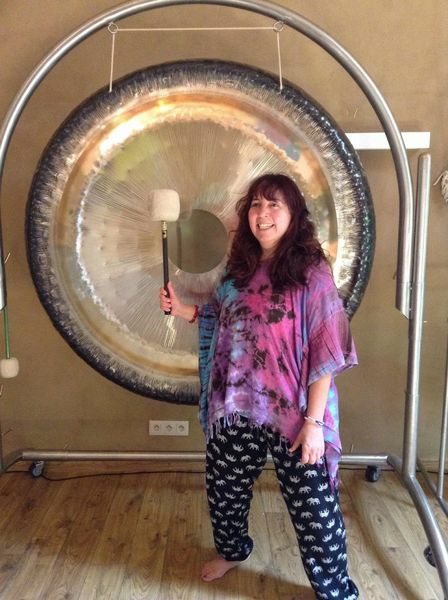 The Gong Yoga of Holistic Resonance, the title of Gong Master, Gong Therapy, The Gong Bath, The Gong Puja, Spiritual Free Jazz, and Songs and Concerts for Humanity.